You don’t need any special tools. You probably have everything you need at home. 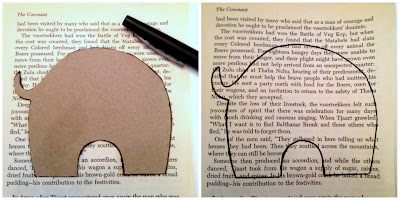 So, grab some paper scraps, your scissors and glue and let’s make some Ephemera Elephants! Step 1: Download the free elephant template HERE. Cut out the pieces. Trace on to cardboard; then cut out the cardboard pieces. This will give you nice sturdy pieces to work with. Step 2: Trace the shapes on various pieces of scrap paper. I used old sheet music, book pages and dictionary pages for the body and bright red paper for the balloon. Step 3: Cut out the shapes on the outside of the black line. You want to keep the black outline intact (except with the balloon). Step 4: Fold the hat. A: Fold short end to short end. 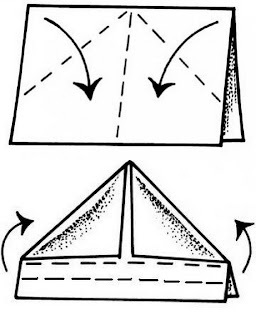 B: Fold in half (left to right) to crease. Unfold. C: Fold left and right corner in to line up with the crease. D: Fold bottom up so that bottom edge meets with bottom edge of the triangles. E: Fold a second time to form the brim of the hat. F: Flip hat over and repeat steps D&E. Finished hat should look like this. Step 5: If desired, glue a piece of decorative paper to the face of the card for a contrasting background. Then, glue the elephant pieces to the card and each other. Ears should go slightly under the head. Step 6: Outline the hat with the black pen. Draw some eyes with the black pen. Step 7: Glue balloon in place. Draw a string with the black pen. Sit back and enjoy your work or write a note to a friend!